Welcome to Ravenwood Manor The back of Ravenwood Manor. The great room, bar, kitchen, dining area, and lofted area. The great room with plenty of windows and a cathedral ceiling. The open kitchen with a bar leads into the great room. Have a seat at the bar The kitchen is beautiful. Another view of the kitchen. The dining area has views and ample seating. The master bedroom has a king bed and a private bath. The beautiful master bathroom. You can`t beat the master bathroom The twin bedroom on the main floor features an ensuite full bath. The full bathroom joining the twin bedroom on the main floor. The king bedroom on the second floor. One of the queen bedrooms on the second floor. The second queen bedroom on the second floor. The full bath on the second floor. The full bath on the second floor. The loft area overlooking the great room has a sleeper sofa. The fire pit. 12 miles to Rock City. Private, spacious home located on private 100-acre wooded tract half way up Lookout Mountain. Beautiful master suite. Open living area with vaulted ceilings. Plenty of deck space and a fire pit. Secluded yet close to grocery stores (6 miles). Close to Lookout Mountain Hang Gliding, Cloudland Canyon State Park, Canyon Grill and Lookout Mountain Pizza Company. Close to Ravenwood Cabin. Larger parties can rent both and receive 10% off the nightly rate. Family/Corporate Retreat! RAVENWOOD MANOR is a high end, 5 bedroom 3 ½ bath home (that is right it is a home, not a cabin). Maximum occupancy at all times is 12. 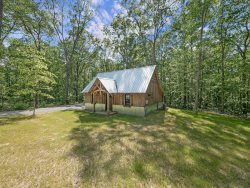 RAVENWOOD LOG CABIN that sleeps 4 is right next door and is also secluded in the woods and they can be booked together to sleep for a total of 16 people if both are rented. Ravenwood Manor and Ravenwood Log Cabin are secluded, wooded, and ½ way up Lookout Mountain (steep driveway and all). The concrete and asphalt paved driveway makes accessibility easy. And, they are only 15 minutes to some of Chattanooga’s most famous attractions (12 miles to Rock City) and only one mile from a hang gliding park! This home has a beautiful timber frame with rough, large beams supporting the cathedral ceiling in the living room, which is also open to the dining room and the kitchen. On the first floor the master bedroom (King bed) has its own private bath. The second bedroom on this level has two twins and an ensuite bath as well. Upstairs there is one king and two queen bedrooms plus a full sized sleeper sofa (in the loft overlooking the living room area). These three bedrooms share a full bath upstairs. There is also a ½ bath at the foot of the stairs in the hallway. Each bedroom is large and very private. A generous sized dining table seats 10, with additional seating at the high bar adjoining the well appointed kitchen. The partially wrap around deck, with built in seating, overlooks the woods. This is a great place to just sit, relax, and enjoy nature. On a strong northwest wind day, you may also watch the hang gliders flying above you. One mile from America’s # 1 hang gliding flight park where you can watch small aircraft (can be noisy during the day) and hang gliders (silently soaring) almost all day every day. There is also a small upstairs deck for lounging and relaxing and/or sunbathing. One favorite place to relax is the sitting area in the shade on the front porch. This covered stone area has a nice view of the woods and the mountain. There is a grassed front yard which also includes a fire pit. Plenty of surface paved parking and an enclosed two-car garage mean you have space for a number of vehicles to park. Wireless Internet that is slow as it is DSL. one large television, and blueray DVD are available. Is a 75 inch TV mounted on the wall big enough? It has a basic direct tv ppackage. With roku you can enjoy movies or even project meeting information. There is also a wood stove that is for decor purposes only (not to be used). Come stay and relax or get away from daily routine to plan for your future. This lovely place provides room to roam and time to breathe. Nice home Very nice home in a beautiful location. Rental management company is very responsive.